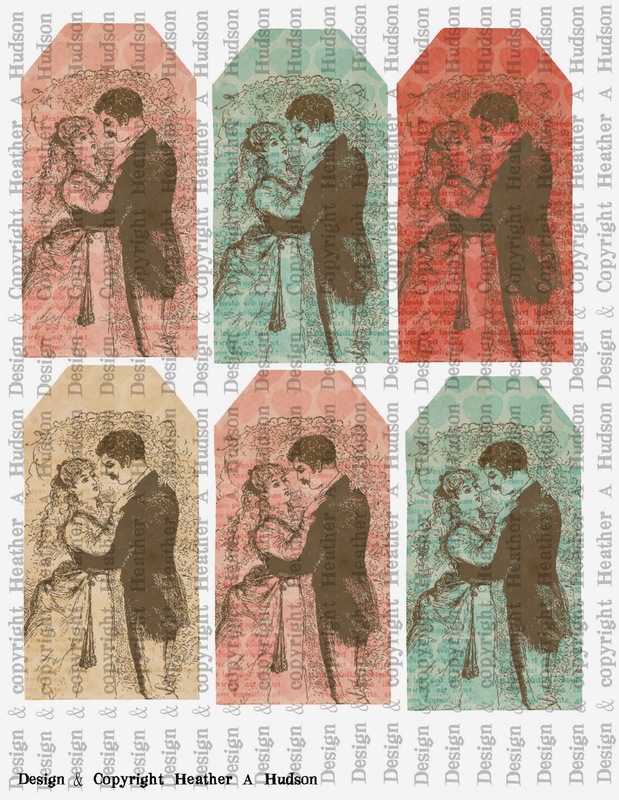 Heather A Hudson: Free Victorian Vintage Valentine's Day Banner Collage sheets Tutorial & Challenges! 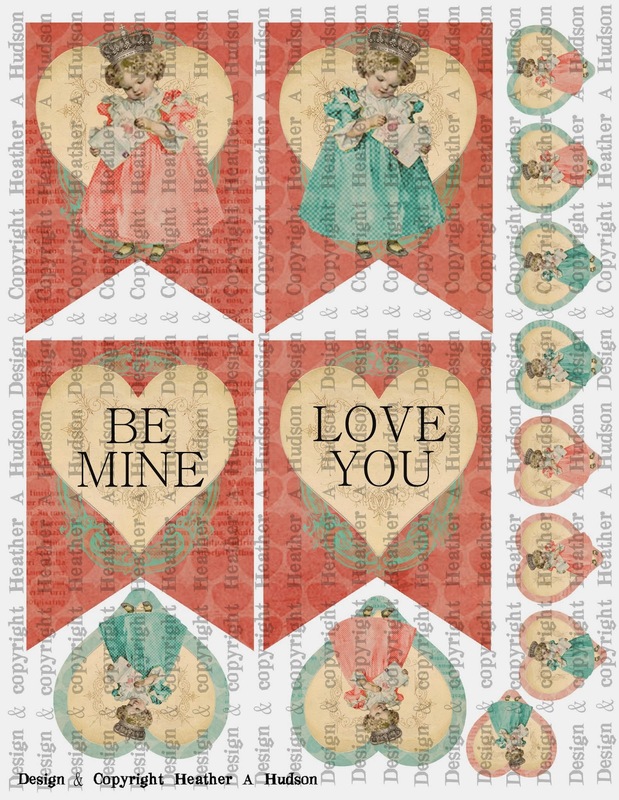 Free Victorian Vintage Valentine's Day Banner Collage sheets Tutorial & Challenges! You can now purchase this banner set in my etsy shop for $5 here. I hope you are having a fabulous day!! You know what that means....a new challenge at Really Reasonable Ribbon!! 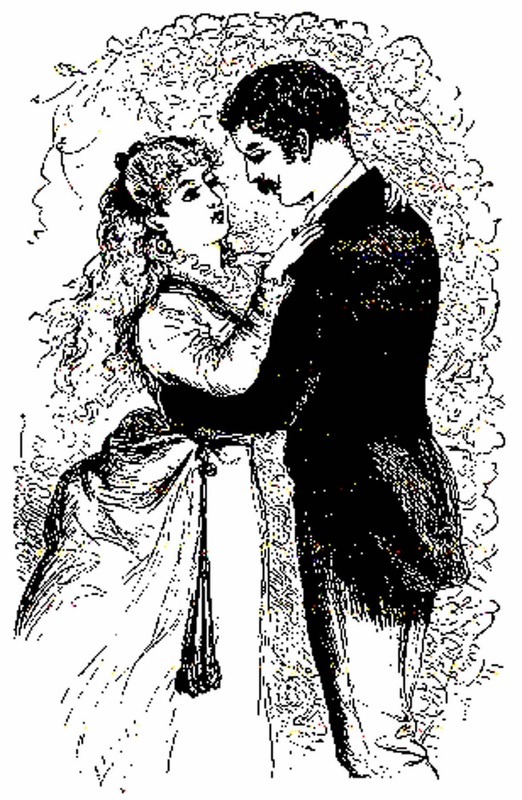 Anything but a card & Ribbon! Featured Designer at Gecko Galz!! Those of you who don't know, Leanne (GG owner) is the one who inspired me to create my own digital collage sheets. Leanne has shared with me a few images that she is giving away for free at Gecko Galz. You will want to sign up for her newsletter so that you too can get the freebie images!! (if you scroll to the bottom of the gecko galz webpage there is an email sign up....that is how you get her freebie sheets each month). Here is what she gave me to play with. 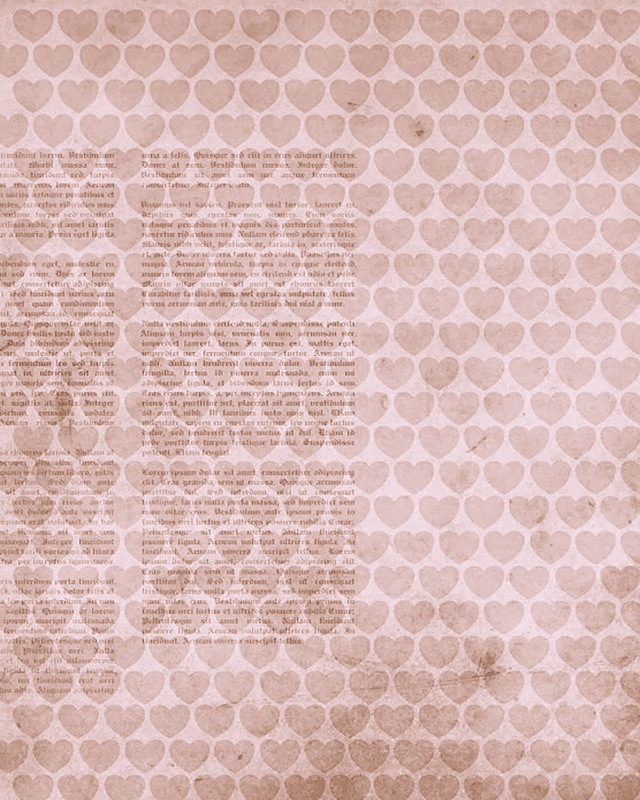 The darling little girl image, the hearts digi paper and couple digi stamp! I changed the color of the little girl's dress, and added a crown, got rid of the heart background :0). I also changed the color of the digital paper. Here is what I created, I of course altered the images and some images from Karen the Graphic's Fairy. I used her Crown, Frame, and heart image. You can visit the links to get them from Karen. Here is my Inspiration piece for you to enjoy! I used my favorite GLue & Glitters from Art Glitter. Here are some close ups! So hard to get great photos of banners! I used bay leaf seam binding, red with white dots organza, cotton candy baker's twine, pink organza, red, pink and deep ivory mulberry roses from Really Reasonable Ribbon. I used my Art Glitter Designer dries clear Glue & Ultra fine Metal Tip and added #208 Fauna, #267 Cheeky Pink, #349 Garnet, & #287 Arbor Glitters. BTW...if you ever purchase anything from the DT's that I am on, please let them know I sent you...I so appreciate it. 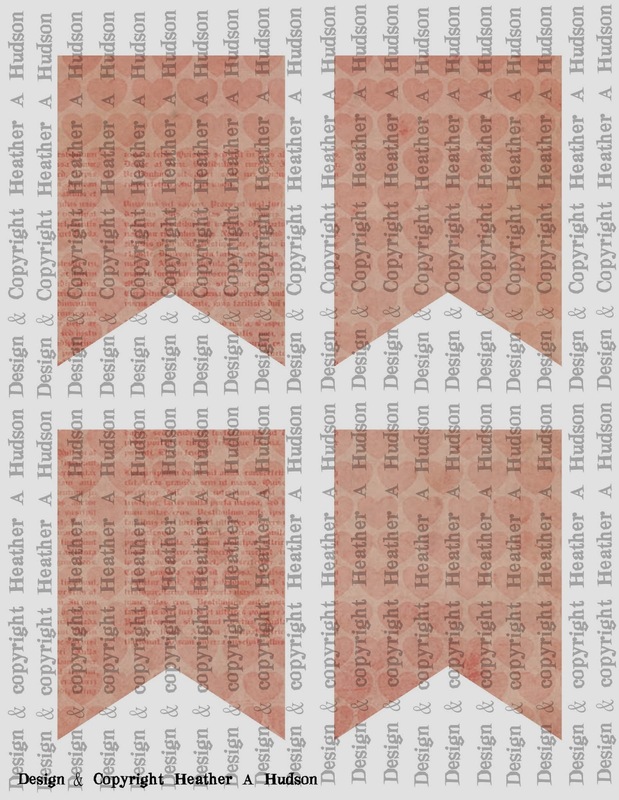 So how would you like the collage sheets that I created for this banner for FREE?? I just ask that you do a couple things for me...because it takes me a lot of time to design my sheets, even though it may not seem like much...it is time consuming. Much longer than leaving a comment, or liking a page :0). I hope that these sheets provide you with at least an hour or two of happy creative time!! I will send the collage sheet to you via email. Anyone that is a new follower by email as of Feb 1st, I will send out the emails at the end of each day!! 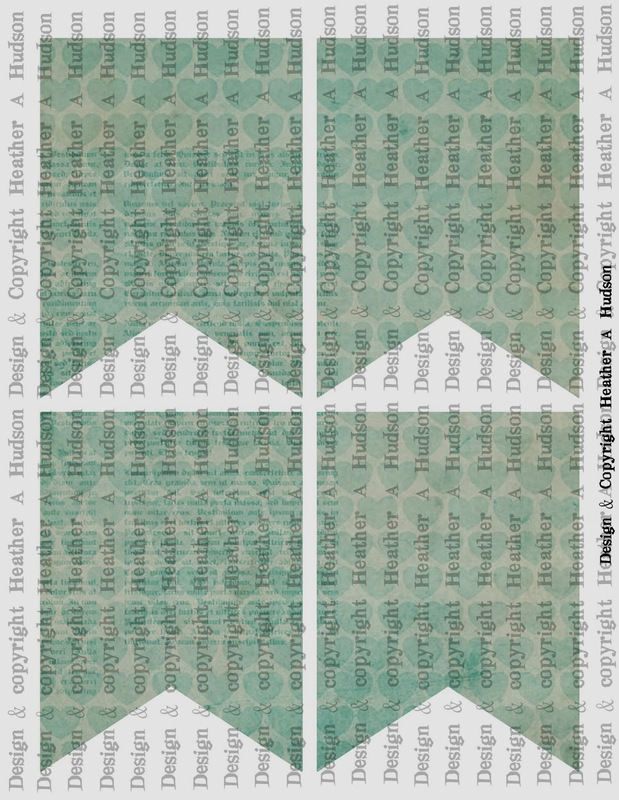 Here are the collage sheets you will receive. One more bit of news!! So feel free to use my freebie images here, create something and link up! Your banner is gorgeous, Heather! And the one from Monday, too! I am loving the soft green seam binding, and the pop of red. And the glitters are gorgeous. Hugs! these are so sweet. love to have them. christi already a follower. I always love your collage sheets!! And I thought Monday's was special. This is simply gorgeous. Just love all the collage images you create. Thank you for sharing your time and talents with us. You make it a fun adventure. Take some time and enjoy the weekend. Fabby, fabby, fabby! Love this banner and what you did with the freebie images is wonderful! Absolutely beautiful and so romantic! Thanks so much for playing along at CCCB!! The banner is lovely and an inspiration. I love your collage sheets and posts. anne.ben already a follower. Thank you for your generous offer. Wow! I just saw this over at RRR! Beautiful! 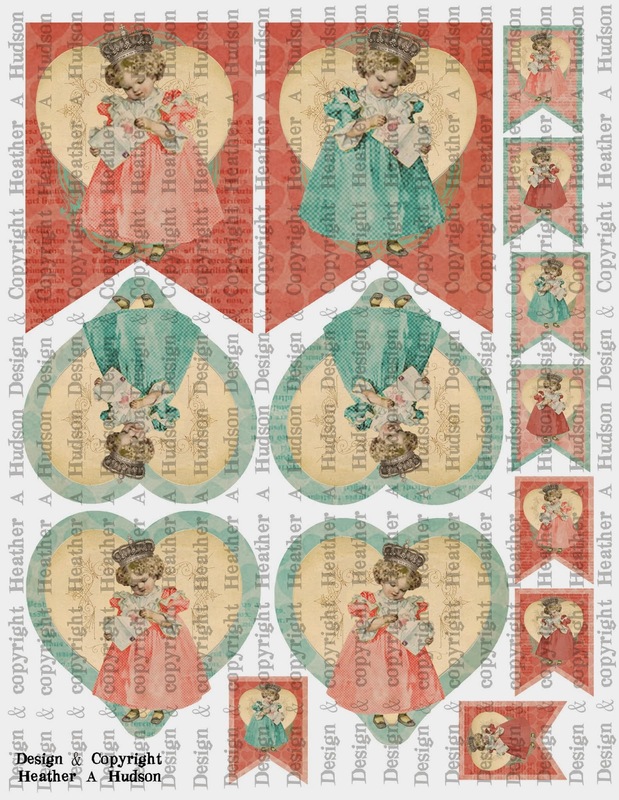 I actually just purchased last week from your Etsy shop some Shabby Chic Plain cream heart tags, Plain cream stamps and the Red Cupid Collage sheet to make some ATC's for a swap I'm in. I had purchased some CHristmas sheets last year or maybe year before last. I am now following you on fb, YouTube and by email Luwe07. I'd love to get the free sheets if they are still available. Thanks! Your work is stunning! So glad I found your blog! I have signed up for your email. (ggsmommy) Thank you so much for sharing your collage sheets and I will favorite your Etsy shop. I love your banner and all your work was on facebook love that I found your carfty work blog! my email is (imblessed1011)Thank you for sharing your collage sheets I have never used etsy but will go visit and find out how to favorite. I watching your youtube video. Hi Heather, LOVE your banner and would love to make one of my own. I am already signed up by on your blog (mmont) are the first 5 letters. Already follow you on interest; and finally liked your facebook page. Now I'm off to check out your Facebook page... Thanks so much! Mary M.
something similar. Thanks for sharing the file. Hi, Heather! 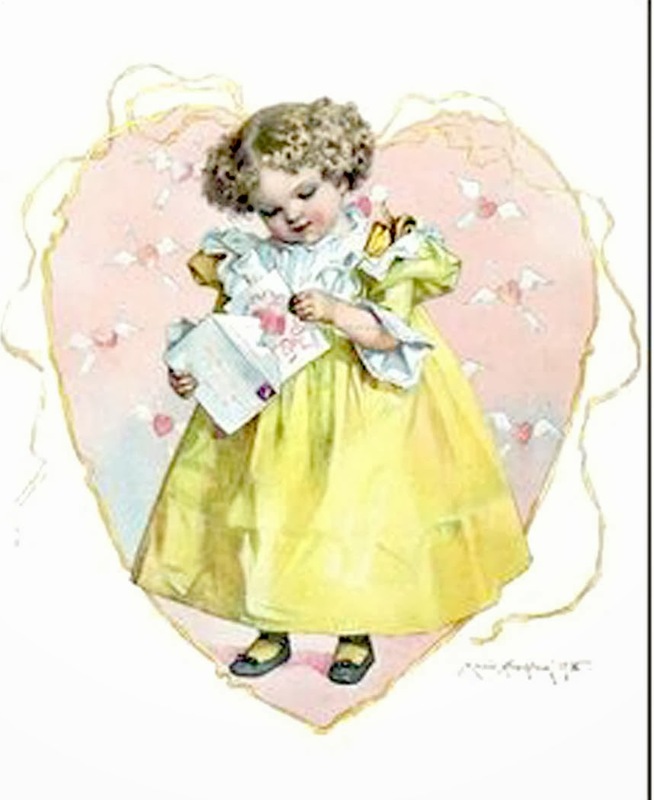 I subscribe to your blog - first five letters - robin - and I love this darling banner! I hope I'm not too late to receive your collage sheets...my mom's in the hospital with a broken hip and a very depressed spirit at this time. I haven't been able to closely watch my blog feeds, but if it's too late to receive the sheets, I'll look for them in your Etsy shop. I think you're so creative and appreciate all the time and effort you give to come up with all your designs. Happy February - I can tell you love this month! Absolutely gorgeous vintage style banner. Thank you for sharing it with us at SCH. These are absolutely beautiful. I am subscribed by email and to your youtube and pinterest boards. I have added your FB page to my lists of Artist I ad mire but at the moment FB is not letting me like new pages. They feel I am too social. I do know it takes time and talent to create beautiful images and sheets. If you are so kind to share, my email is wismom. Woow...Beautiful banner! Fabulous your work!Your blog is for me great inspiracion! !Thank you! Gorgeous banner! Thank you for joining us at Crafty Calendar for our latest challenge!